Privacy Register is a simple privacy management system built on the idea that GDPR privacy registers should be standardised and open. Privacy Register takes you through the legal requirements and adds processing activities to the database right (and solely) in your browser. Privacy management software is developping fast. Privacy Register is easy to export and maintain elsewhere. Privacy Register open sources the core of privacy management and introduces the ability to have a fully functioning standardised privacy register right in your browser, for free. Privacy Register offers a simple and secure platform. Your privacy register is solely stored on your device. We have no access to your data at all! Privacy Register has only a few core concepts and a list of content types prescribed by Article 30, and yes, we have also taken into account Article 13 & 14 and 28. This is purposeful: you can master the concepts quickly, and build privacy registers without constantly referencing the documentation. If you’ve ever read parts of the GDPR, Privacy Register will be very familiar to you. Add processing activities and Privacy Register will automatically create content types in your register. There are 13 content types of which some can be further specified in an array. 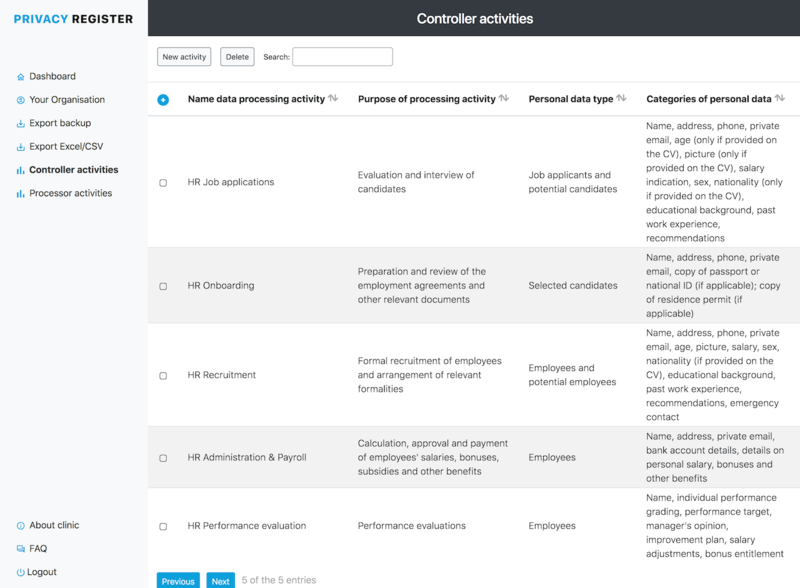 Legal bases can be applied to processing activities based on the personal data processed. They allow you apply them combined to either general categories of personal data or special categories of personal data.